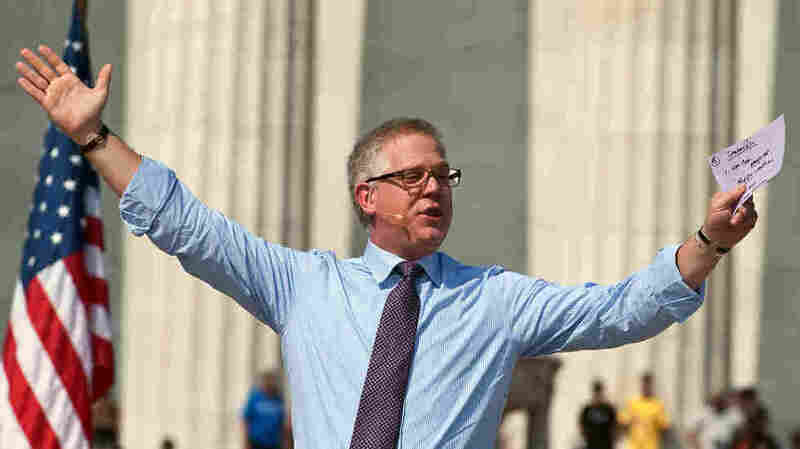 Glenn Beck's 'Restoring Honor' Rally: What Do You Think Now? 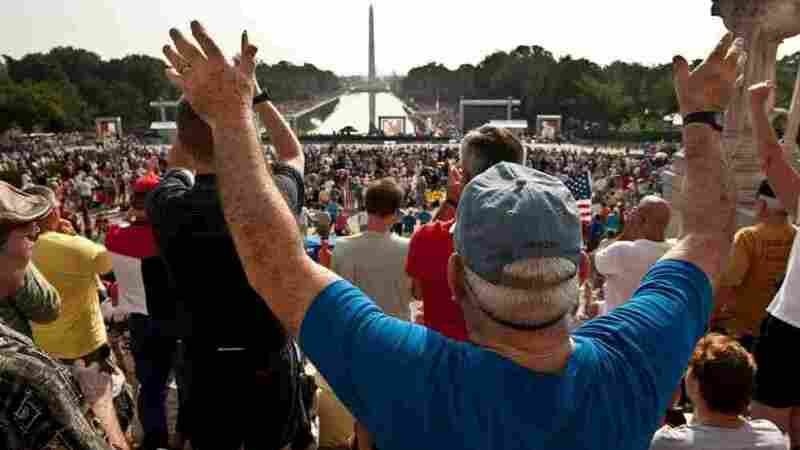 : The Two-Way The conservative broadcaster drew thousands to the National Mall on Saturday. Along with Sarah Palin, he spoke of turning back to God. After all the talk about whether his "Restoring Honor" rally at the Lincoln Memorial was divisive because he had chosen the location and anniversary of Martin Luther King's 1963 "I have a dream" speech, how is conservative broadcaster Glenn Beck's event playing on the morning after? Well, NPR's headline puts it this way: "On The National Mall, Divisions Kept In Check." Topping her story with both the Beck rally and a another gathering aimed at honoring the anniversary of King's speech, reporter Andrea Seabrook says that "the National Mall in Washington, D.C., became a crossroads of American politics Saturday. Two rallies represented two very different ideas of what this country is and should be. Tens of thousands of conservatives gathered to honor the military and Christian values, while a much smaller group demonstrated in honor of the 47th anniversary of Martin Luther King Jr.'s March on Washington." Among those leading the second event was the Rev. Al Sharpton. "The event was billed as 'nonpolitical,' and Beck steered clear of the partisan commentary that has made him a hero to many conservatives and a nemesis to many on the left. But political overtones were unmistakable, and the rally drew an enormous crowd -- including many who said they were new to activism -- that was energized and motivated to act." Among the speakers who helped draw folks in, of course, was 2008 Republican vice presidential nominee Sarah Palin. The New York Times leads its story this way: "An enormous and impassioned crowd rallied at the steps of the Lincoln Memorial on Saturday, summoned by Glenn Beck, a conservative broadcaster who called for a religious rebirth in America at the site where the Rev. Dr. Martin Luther King Jr. delivered his famous 'I Have a Dream' speech 47 years ago to the day." Fox News, one of Beck's broadcast outlets, says that "huge crowds at Glenn Beck's 'Restoring Honor' freedom rally -- organized to give thanks to U.S. troops -- left Washington, D.C., on Saturday night pleased by the theme and the turnout -- as thousands in attendance returned home carrying a message of making America better." At the widely read conservative webste HotAir.com, blogger "Allahpundit" thinks that "in a way, the rally ... mirrored rallies held for then-candidate Barack Obama in 2007 and leading up to the election of 2008. Both this rally and many of Obama’s featured mesmerizing speakers, who chose to inspire audiences by rhetorically empowering them to take matters into their own hands." But, Allahpundit adds, "while Beck’s rally emphasized belief in God, Obama’s generally emphasized himself as a savior of the American people." The liberal website Talking Points Memo chose this headline for its story: "Glenn Beck's 'Restoring Honor' Rally Brings Out The Red, White And Blue Sequins." As for Beck himself, he said Saturday that "something ... beyond man is happening. ... America today begins to turn back to God."